ATLANTA -- This is the Falcons team fans were hoping to see much more of in 2018. Sparked by a Deion Jones pick-six in the first quarter, the Falcons played their best game on both sides of the ball this season and rolled to a 40-14 victory. There were plenty of positives to point out in this one, so let's get to it. Here are 10 things we learned from the win. The box score may not reflect it, but Vic Beasley had a very solid game for the Falcons on Sunday. 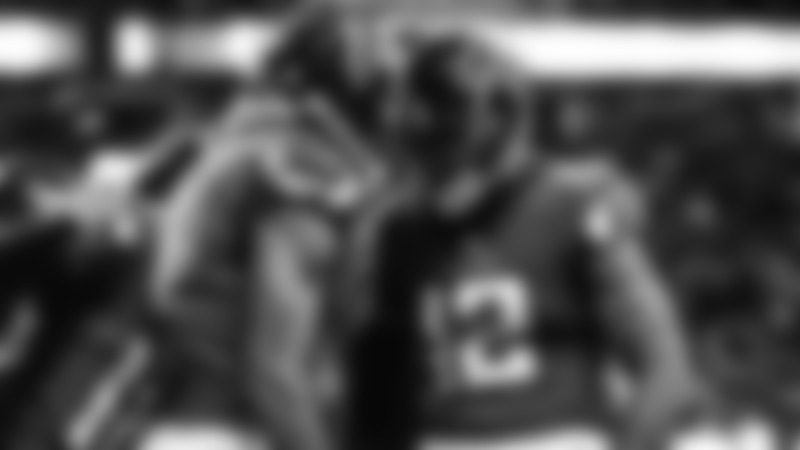 He generated consistent pressure against Rosen and earned a sack, tipped multiple passes – one of which landed in Deion Jones’ arms for Atlanta’s first touchdown – and diagnosed several screens quickly. Beasley’s future status has been a topic of conversation among fans of late, but he played at a high level against the Cardinals. The third-year Pro Bowl linebacker continues to be a playmaker for the Falcons’ defense. In the first quarter, Deion Jones snagged a tipped pass and returned it 41 yards for Atlanta’s first touchdown of the game. It was his third career pick-six, and the type of big-play ability the Falcons’ defense has been missing for much of this season. One of the few negatives to point out in this game was an unusually high number of dropped passes. Consecutive dropped passes killed on drive in the third quarter and stalled a couple of other drives earlier in the game. They weren’t a major problem on Sunday, but it’s something worth pointing out. He suffered a rib injury heading into halftime and played very sparingly in the second half. Given the Falcons’ big lead over the Cardinals, Jones wasn’t needed and therefore able to rest. Had the game been close, Jones may have been able to play through the pain as he did enter the contest in the third quarter. There has been a noticeable shift in the Falcons’ defensive approach over the past two games; Atlanta has begun bringing pressure at a higher rate. 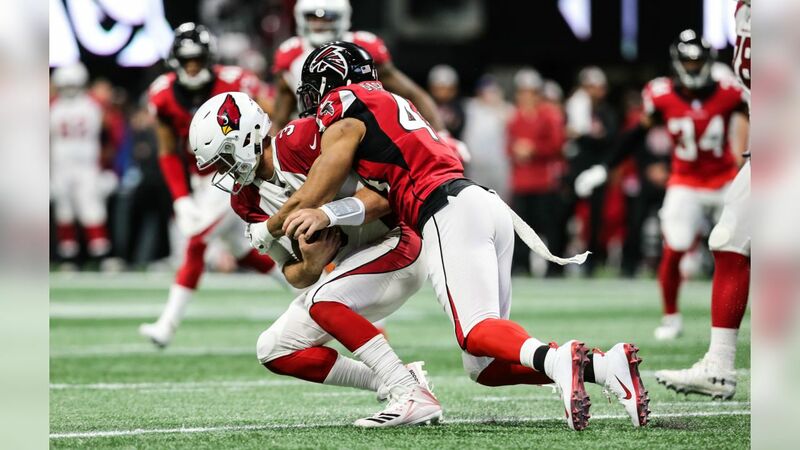 That was obvious on Sunday, as the Falcons regularly blitzed the Cardinals’ depleted offensive line and never allowed rookie quarterback Josh Rosen to get comfortable. This attacking approach is nice to see from the Falcons, and the pressure seemed to have a positive impact on the rest of the unit. Atlanta finished the day with a season-high seven sacks. Atlanta’s increased pressure on Sunday helped the Falcons create plenty of turnovers. The Falcons’ defense forced three turnovers, including Jones’ pick-six. Falcons coach Dan Quinn said he wanted to see the team win the turnover battle over their final three games, and Atlanta got off to a great start in that area on Sunday. It was a great day all around for the Falcons. Outside of the first drive of the game, Atlanta's defense stifled any sort of threat from the Cardinals' offense until well into garbage time. The defense held Arizona's offense to just 253 yards, forced three turnovers and notched seven sacks. Offensively, Atlanta ran the ball exceptionally well, gaining 215 yards on the ground and 435 yards, overall. The Falcons got the run game going on Sunday, and Tevin Coleman was the man leading the way. Late in the first quarter Coleman broke free for a 65-yard gain, the longest run of his career. In the third quarter, Coleman went over the 100-yard mark for the third time in his career on a 43-yard touchdown run that gave Atlanta a 33-7 lead. Coleman had another 44-yard touchdown run called back due to a penalty in the fourth quarter. Coleman finished the game with a career-high 135 yards and one touchdown on 11 carries. This has been a tough season for the Falcons, no question. Sunday provided a glimpse of how they can play when firing on all cylinders, however, and it’s still a sight to behold. More importantly, Atlanta snapped its five-game losing streak. Yes, it came against one of the worst teams in the NFL, but it’s a step in the right direction with two games remaining. For more analysis of the game, check out our in-game live blog, below.